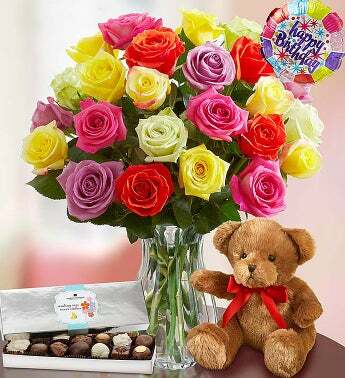 Our bouquet of roses in a rainbow of colors will make their birthday truly vibrant. Paired with a festive balloon, it’s sure to make their special day the best one of the year! Delicious assortment of Harry London® chocolates in a silver foil box that reads: "Sending You Sweet Smiles”; 6 oz.